Work OK. Some service issues. Fairly easy install but supplied cable outers and inners may be too short. Cable stops didn't fit one bike. Work OK. Grey caps fall off or wear through and no spares. Awkward to lube but seize up if not. Can this work with 10 speed campy? 1. What is total cable pull (one end of travel all tne way to other end? 2. Will this length of travel be sufficient for the 9 speed shifter to work in friction mode with campag comp triple rd and 10 speed centaur cassette 13-29? We do not have these shifters set up to measure the cable pull I am afraid, we would expect the shifters may work with the 10 speed stuff, but again, we have not tested this. Are there spares available for these. I have an older pair of these, that are missing the plastic ring that's held by the screw on the RH shifter. Friction shifters will work with anything as there is no indexing! Do the frame stoppers include barrel adjusters? The down tube cable stops do have built in barrel adjusters yes. Although the shifter is indexed for 9spd it can be used with an 8spd derailleur as well. These have been known for a long time to include a friciton setting as well. Does this model have this, too? 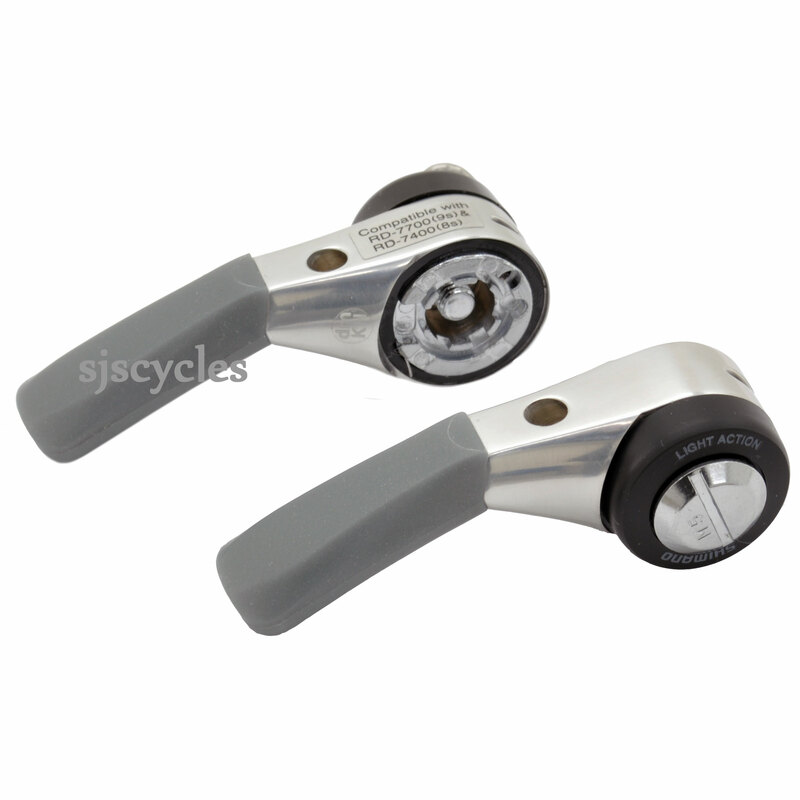 The left hand shifter is permanently friction and the right hand can be switched between 9spd indexed or friction shifting. Are The Covers For These Shifters Available As Spares ? Plastic (Rubber? )cover/sleeves on the bar end shifters stolen while my cycle was parked unattended. Now not quite so cumfortable to use. Can you help please? I'm afraid that the covers you are after were never made available as spares.